UCO Bank Rewardz, is a customer loyalty program for all UCO bank account holders.You can read my previous post where I have explained how to join at UCO rewardz program.Once you successfully registered your debit card, you are eligible to earn points upon transactions.You can earn points with your UCO bank debit card (VISA or RUPAY)for online shopping,booking tickets, paying electricity bills, internet banking and ATM withdrawal services. Before I show you step by step recharge process, I request you to write down your UCO Rewardz A/C user ID and password for future use.If you forget your account credentials, you can reset it with your registered mobile number. Once you accumulated enough points you can redeem it for online DTH or mobile recharge.You can use points for shopping or other booking services like movie ticket booking, bus ticket booking, Air and Hotel ticket booking. Okay, let’s go ahead with recharge steps.Follow the below instructions where I have shared screenshots for easy understanding. Firs, visit official UCO Bank Rewardz portal.It is highly secured and open fast. Mobile number that you want to recharge. 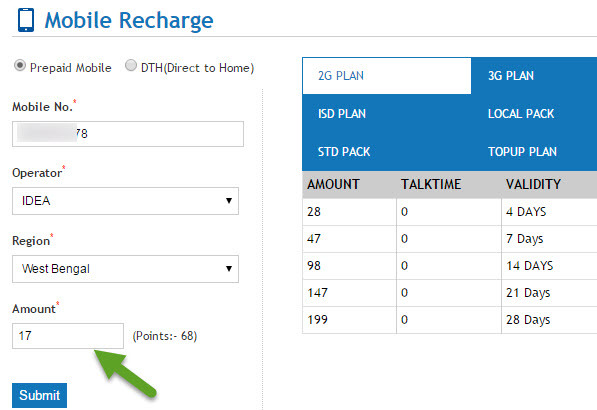 Choose your network operator from the drop down menu listed there. When you enter all these details click on submit button.The link action redirects to the next confirmation page.here you can see quick mobile/DTH recharge confirmation.If any error occurs go back to the previous page and edit the mistake part. Under member details, it contains Name, Mobile number, and email ID.These fields are to be filled for the confirmation message.Enter a valid mobile number and active email ID to get confirmation notification upon successful recharge. Tips: Earn additional rewardz points becoming partner of Max Get More.Besides that some general ways to earn points are debit card,ATM cash withdrawl,using net banking services.